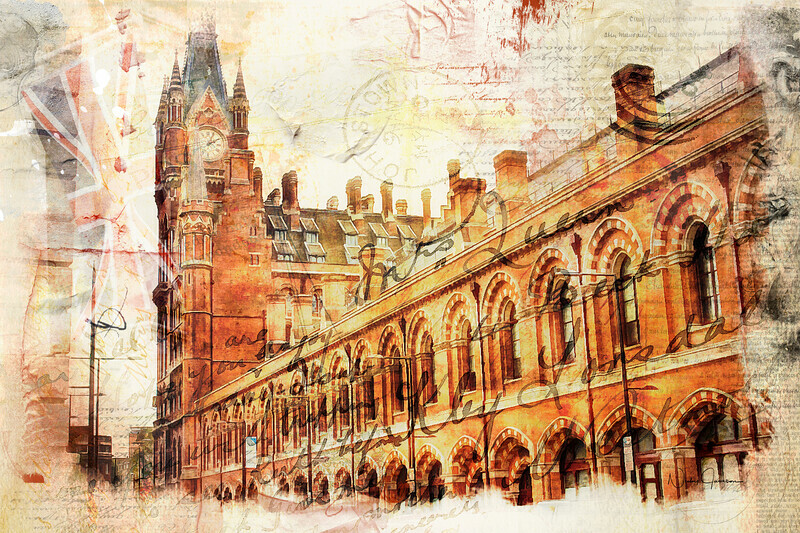 I started off with my photograph of St Pancras Hotel. It is a photo that I took in 2016 and have been waiting for the right time and treatment for it. I decided I wanted to use a Vintage treatment for this beautiful building. That decided, I first of all created a watercolour effect then applied some vintage textures with old script. I love old script because it lends that little bit of unexpected interest to the composition. Then I built the background from multiple layers and painted in more artistic splats, plaster and artsy stains, including post marks to complete the vintage, nostalgic and grungy feel. I often listen to music while creating my compositions and it's slightly amusing that I was listening to EDM (Electronic Dance Music) while creating this piece. Such is life.